A school project could lead to Peter Mitchell swimming Cook Strait. The 17–year-old is a student at Lower Hutt’s Raphael House, where all year 13 students are required to undertake a project. Peter, who hopes to become a professional jazz musician, decided to give ocean swimming a go. He started with Ward Island and followed that up with a swim to Matiu/Somes, which he enjoyed so much he repeated it a week later. He recently added Mana Island and his next challenge is Kapiti Island. Mana is seldom attempted because of its strong currents and Peter ended up spending much longer in the water than planned. It, however, boosted his confidence and reinforced his passion for the sport. He decided to try ocean swimming after looking at Matiu/Somes and thinking it would be “awesome” to test himself by swimming there. His thoughts have now turned to how far he can go in the sport. 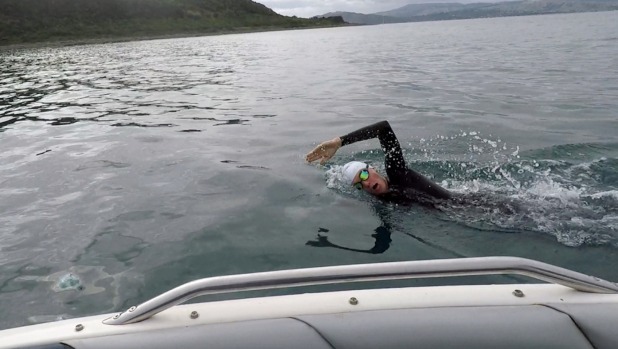 Cook Strait swimmers sometimes encounter sharks but that does not deter him. He plans to go to university and study either music or marine biology. The school project aims to extend the students and he is also required to write a report on what he has achieved.